Now that we’re well and truly into summer, it’s about time that we talked about some of the beautiful summer makeup that has arrived with us at Escentual. First up is the absolutely breathtaking collection of summer offerings from Guerlain. With each and every summer Guerlain dazzles us with their gorgeous Terracotta innovations and this year is no exception, with an ancient Incan inspiration that blends bronzes and neutrals with neon brights and jeweled hues. The neon bright theme is incredibly hot this summer! We’ve already seen the fluorescent offerings from Dior , and there’s gorgeous products from NailGirls and Givenchy to come too. The glowing hues of the Sheer and Shine Finish Lipgloss range from fuschia to orange, and envelop the lips in luxury and comfort. The star product of the collection is this definitely the gorgeous illuminating bronzing powder. This decadent compact is comprised of two complementary hues: golden beige and light pink, a pairing that creates the perfect balance of warmth and coolness. The inclusion of ultra-ultra-ultra fine golden shimmer is just lovely. This new innovation from Guerlain is a must for summer holidays. The striking metallic hues of these cream eyeshadows are completely waterproof, sweatproof and heat proof, yet still retains a flattering and comfortable powdery finish. The three warm shades are perfect worn alone or together, making eyes pop with iridescence. Perhaps my favourite product in the Guerlain summer collection, the 4 shade eyeshadow is so incredibly vibrant and beautiful. The four complementary shades allow you to shade, contour and colour the lid with ease. All the while, the pale gold overlay infuses each colour with a subtle iridescence that lights the eyes with a beautiful glow. This cult kohl is recreated for 2011 in gorgeous packaging and an even inkier black hue. The intense carbon pigment gives eyes a deeply sensual look, which can be blended and smoked out easily. The versatile shape of the kohl lets you precisely define the shade of the eyes, as well as colour the entire lid in a single swipe. 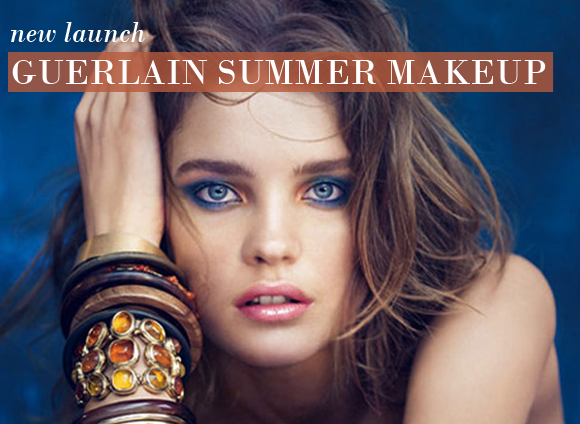 Discover the Guerlain Summer 2011 collection right here! This entry was posted on Wednesday, June 8th, 2011 at 10:02 am and is filed under Make-up, New products. You can follow any responses to this entry through the RSS 2.0 feed. You can skip to the end and leave a response. Pinging is currently not allowed.